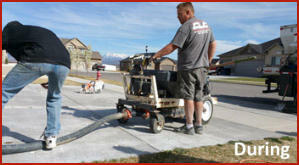 CLC Concrete Lifting & Repair in Southern Utah - All Concrete Services! Concrete Lifting Concrete settles for several reasons: • Poorly compacted earth • Improper flow of water • Natural springs • Lines dug for sprinklers • Lines dug for cables • New water or sewer lines • Etc… Concrete Lifting Company is the best solution to overcome hazards and structural problems created by settling concrete. For years people have had to deal with these hazards or else go through the tremendous expense of replacing the troubled areas. CLC is able to solve this problem for you. Our special methods and equipment can leave your concrete properly lifted and stabilized, providing a long term solution, restoring your concrete to it’s original functionality. The process for Concrete Lifting? ( Also known as mud jacking, slab jacking, concrete leveling, slab leveling, pressure grouting ) you can call it whatever you want! It will still give you the same outcome! 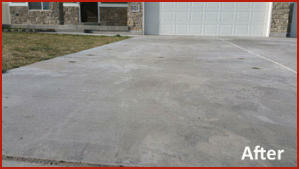 Concrete lifting is a process that raises sunken-concrete back to it’s original level. 1. 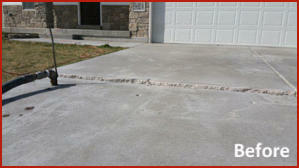 We do this by drilling 1 1/2″ holes through the top surface of the concrete slab in strategic locations. 2. Then under hydraulic pressure, pump a flowing cement grout through the drilled holes. 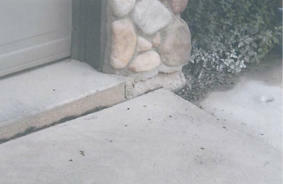 When the void under the concrete is filled with the concrete mixture, the concrete will raise. We do this until it’s back to the proper height, grade and alignment with the surrounding concrete slabs. 3. Then the holes are filled with a non-shrinking concrete mixture. 4. 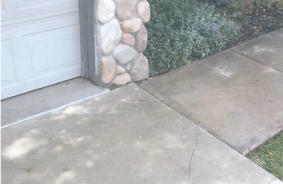 Then we take extreme care to clean up completely and make sure you are completely satisfied with the job. As soon as it’s done, it’s ready to use!